Thank you for visiting Mindmp3.com. If you are reading this you are probably seeking a method to help you with a personal issue, improve your self esteem or find a tool to give you a boost towards achieving your goals. My name is Dino Ruales, I'm the creator of Mindmp3.com. If you are like me you are always aiming to achieve the best things in life. Have you ever failed to achieve a goal or quit trying? I sure have. Many times I felt that everybody was against me... heck I felt the whole universe was against me. I was struggling to achieve goals that I "thought" were too far from my reach. So one day I stopped and asked my self: "Is it just me or why does everything seems so hard?". Later I found the answer. If you've asked yourself the same question, this is the answer: Yep in the majority of cases it is you. YES our own mind works against us. Let me tell you it's true! Our own brain is limiting us to achieve the full extent of our capabilities! Why!? It is a self defense mechanism. Let me explain. If I told you to go and jump of a bridge would you do it? I hope not! :) and I'm sure you wouldn't. Our brain has evolved from a reactive instinctive behavior, to a mix of instincts and reason. Our conscious mind reasons, reflects and filters thoughts. It prevents us from doing things that may harm us. That is good. But the trade-off is that, in the process, it also rejects other thoughts and ideas that "seem" to go against our beliefs. Our mind over the years acquires beliefs that sabotage our own success! If you were constantly praised, you grew up with confidence. If you were constantly criticized, you grew up feeling powerless. If you were like most of us, you grew up with some praise and some criticism, so you are only partially screwed up :) Behold the power of words. Our minds are especially vulnerable at a young age. While we grow up our conscious mind forms do's and don'ts. When we are young we don't question things, we are open to new ideas. Have you seen how fast kids learn a new language or learn to use the computer? It's amazing. When we are all grown up, than "mind openness" becomes more like "mind closeness". So what can we do? How about bypassing the conscious mind and giving ourselves positive input, using a direct, straight to the subconscious path. Here is where Subliminal Affirmations come in to play. Subliminal affirmations are positive assertions encoded in a frequency on the border of normal human hearing, thus making them inaudible to the conscious mind but received by the subconscious. A suggestion to the person at a level inaudible or invisible to the conscious mind will be entered directly into the subconscious mind. The subconscious mind accepts commands without questioning them. Our subconscious is exposed since we are in our mother's belly! YES even then we receive suggestions and our brain makes them ours and interprets them once we understand words at a very young age. We are very vulnerable also when in times of pain (physical or emotional), distress, unconsciousness (externally induced: e.g. under anesthesia; Or self induced: e.g. while in sleep). It is then when bad commands can get through easily to our brain. While we are fully aware, commands are reasoned and filtered. In order to influence in a positive way we need to deliver good, favorable commands in an unnoticeable and repetitive way. Mindmp3 audios contain Subliminal Affirmations embedded in Natural Sounds and easy listening Music. They are encoded using the Silent Subliminal technique. Affirmations are shifted to a frequency bordering the human conscious perception. So they can be mixed with music or sounds without any interference. Looking at the resulting audio with a sound editor program you can see the normal frequencies and the subliminal frequency range. They come in two audio formats: MP3 and WAV. Encoded at a high resolution, minimizing any data loss. With the MP3 format you can copy the files to your portable device and listen to the tracks at your convenience. You can use the WAV format to listen on your computer (most media players support WAV files) or create an audio CD and listen to it on your home or car stereo (a quick Google search can help you with instructions on how to create an audio CD with WAV files). You can choose over 60 different Albums, each focusing on a certain subject. What is your goal? Check out our catalog and find the album that suits the area in which you want to improve. Each album comes with 6 tracks. 5 Natural Sounds and one silent track that contains only subliminal affirmations. Follow the easy and quick checkout process. After ordering you will return to log in and customize your order. After checking out you will be asked to create an account or log in if you already have an account. Click on your order. If you chose customizations or delivery you will be prompted to customize your album. Save your changes and we will let you know by email when the Album is ready for download. If you chose no extra customizations, you are ready to go. Your links will be ready for you to download. Important: Please note you will have a limited number of days to download your audios. After that time the files will not be accessible. 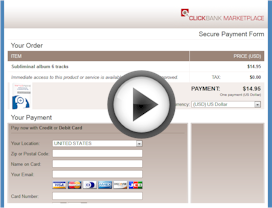 Watch a video of the order process and the download area.